As the Maligne River drops into the Athabasca River Valley, its gradient is particularly steep. It is not known exactly how the canyon formed, but one theory is that as the ice that covered the Maligne Valley during the last ice age melted, it dug into the valley floor, eventually wearing through the bedrock to an underground passage, creating a canyon. In the estimated 14,000 years since the end of the last ice age, water has continued the erosion process, deepening the canyon and smoothing its walls. The most popular access point for Maligne Canyon is where Maligne Lake Road crosses the Maligne River just over six kilometres (3.7 miles) from the Yellowhead Highway. Here you will find a large parking area, an interpretive kiosk, and a restaurant/gift shop complex. 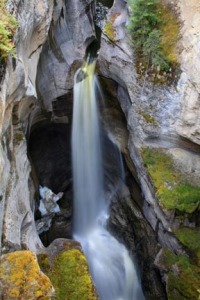 From the north corner of the Maligne Canyon parking area, a trail follows the canyon downstream for 3.7 kilometres (2.3 miles). While the trail crosses the canyon six times, the most spectacular sections are seen at the upper end of the trail, with the first two bridges being the best vantage points. At the top of the canyon, opposite the restaurant, you’ll see large potholes in the limestone riverbed. These bowl-like depressions are created when rocks and pebbles become trapped in what begins as a shallow hole; under the force of the rushing water, they carve jug-shaped hollows into the soft bedrock. Eventually, a series of these holes may lose their circular shape all together and form a channel. The first bridge overlooks the canyon’s highest waterfall. Here, the Maligne River forces itself through a narrow opening, creating a spectacular 22-metre-high (75-foot) cascade that enters the canyon with an audible roar. Bedrock along this portion of the trail has been dated to the late Devonian period (around 360 million years old). At the second bridge, look for large fractures on the smooth limestone walls. While these fissures formed many millions of years ago during the mountain-building process, they have expanded as a result of water seeping through the porous limestone. In the winter, when water in the bedrock freezes, it expands and creates pressure, forcing the rock to crack further. The second bridge also marks the deepest point of the canyon—55 metres (180 feet) high. Although the canyon is not as deep at the third bridge, the canyon here is at its narrowest. A short way further downstream, just below the fourth bridge, is a spring whose source is Medicine Lake, further up-valley. Although the canyon is one of the most popular natural attractions in Jasper National Park, few visitors hike the entire length of the trail. By beginning from the lower end of the canyon, at the confluence of the Maligne and Athabasca Rivers, you’ll avoid starting your hike alongside the masses and you’ll get to hike downhill on your return (when you’re tired). To access the lower end of the canyon, follow the one-kilometre (0.6-mile) spur off Maligne Lake Road to Sixth Bridge. Crowds will be minimal for the first three kilometres (1.9 miles) to Fourth Bridge, where the trail starts climbing. By the time you get to Third Bridge, you start encountering the most adventurous hikers coming down the canyon, and soon thereafter you’ll meet the crowds. At the top of the canyon beside the main parking lot is Maligne Canyon Restaurant and Gift Shop (Maligne Lake Rd., 780/852-3583, April-May daily 9 am-6 pm, June-Sept. daily 8 am-7 pm, Oct. daily 9 am-6 pm), which has a large restaurant with inviting outdoor tables and a gift shop offering a wide range of books and souvenirs. The business has a long history on the site. Early visitors arriving by horse or on a carriage were usually hungry and tired after what was then a long journey from the railway. In 1914, a crude log shelter was built near the top of the canyon. It had two bedrooms for overnight guests, and a living area. In 1927, Merle Brewster, wife of local outfitter Jack Brewster, opened a log tea room overlooking the top of the canyon. The original building was replaced in 1963 and after a succession of owners—including Bill Ruddy, who operated boat tours at Maligne Lake for almost 30 years—the current owners took over in 1980.